I met Maria Trewern at RCN headquarters in central London a couple of weeks before congress and then interviewed her again, by phone, after she returned from Belfast. 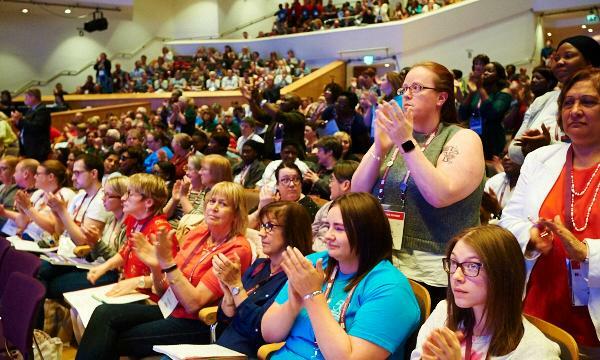 On both occasions I was struck by her enthusiasm – for nursing, for RCN members, and for the opportunity she has been given, as chair of council, to get things done. As chair, elected by her fellow council members, she is responsible for making sure the college has ‘a complete strategy’ and for delivering that strategy on behalf of the members, along with the core priorities set by the council. It is her job to take what happens at congress – the resolutions and matters for discussion – and turn it into something tangible, so that what is said in the conference hall informs the work of the RCN and, where appropriate, translates into policy and action. Her day job at NHS Professionals, as head of workforce insight, involves examining workforce issues from a management and clinical perspective and coming up with solutions that work for staff and patients. Her breadth of experience – personal and professional – is unusual. Ms Trewern has had roles in the NHS and the independent sector, working her way up from cadet nurse to associate director of nursing, and managing her own company along the way. She comes from an impoverished working-class family and grew up in care. When she condemns the scrapping of the bursary and says nursing students have to be able to afford to live, or they will be lost to nursing, she is drawing on her own experience. Ms Trewern has the ability (useful in a leader) to be outraged and optimistic at the same time. She points out the dire consequences of failing to nurture the nursing workforce, but also says the future of nursing is in safe hands because the students she meets are amazing. 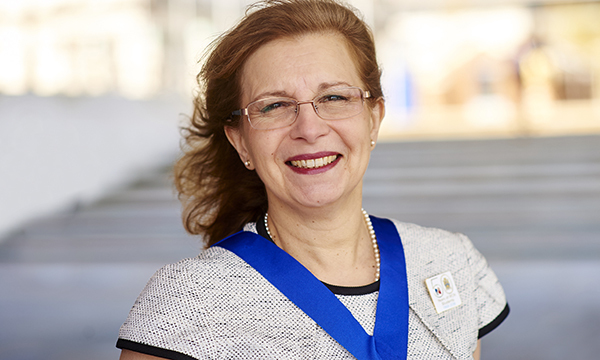 She wants to help unlock the power of RCN members (‘there are no “ordinary” members,’ she says), improve how the college engages with members and communicates its message, and increase its influence. She has faith in the members, and clearly wants them to have faith in themselves, so they can challenge when things are wrong and insist on a better deal for themselves and their patients. None of this is easy, she admits, but it is ‘the right thing to do’. Ms Trewern doesn’t demand that you agree with her - the 'hurtful' ferocity of the debate on the pay deal, at least as it has played out in some sections of social media, is not her style - but she does think everyone should engage with the big issues. Whatever your position on the pay deal (she’s in favour) she wants you to contribute to the consultation and vote on whether it should be accepted. You pledged to make sure the RCN delivers for members. What can it do better? It is about getting members actively engaged – but we also need to use different media to communicate so we get our message across, and members can get their message across. I think we could use social media better. I want to see us grow our influence, internationally and nationally, so that when someone thinks nurses and health their second thought is Royal College of Nursing. We are the largest professional organisation in the world. If anyone can do it, we can do it. How can the college increase its influence? We need to use our members far more as our ambassadors. They should speak for the college. 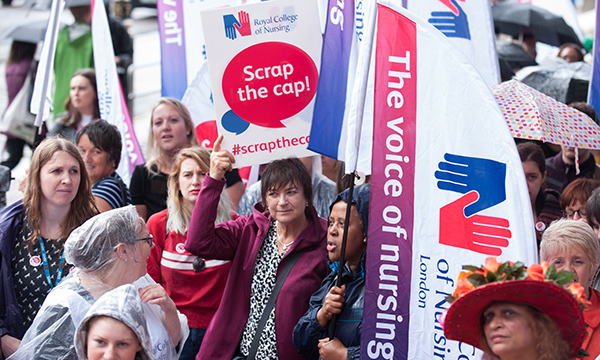 We are a force to be reckoned with – as we demonstrated with the scrap the cap campaign. We have to harness that level of engagement. Do nurses have the skills and the confidence to exert that kind of influence? The issue is that they are exhausted doing the day job. We need to give people time and support to develop into confident leaders. It does take guts to put your head above the parapet, I know that. But I want to support people to take that step because it’s important to be a visible leader. I want people to relate to me as a leader. Traditionally the council of chair does not have as high a profile as the general secretary or the president. How can you be sure you will have an impact? I think the power of three is better than the power of one! Members in my region voted me onto council to speak up. That’s my role – and I’m not afraid to speak up. Have you ever spoken up on an issue, earlier in your career, and felt the cost? I have been out there, campaigning. It was the 3% pay campaign, which is going back some time ago – and I had my daughter with me, who was only four, and someone came up to me and told me I was a disgrace to the nation. I said it was a disgrace that nurses were paid so poorly when so much was expected of us. I have also spoken up for zero tolerance – I won’t tolerate bullying. Speaking up is a challenge, but you have to do what’s right. Being silent is consent, is it not? Is it hard to get exhausted people to engage with big issues, to step away from the daily pressures? It’s incredibly hard. Our staff survey last year showed people were in despair. But despite everything they kept doing more because they didn’t want to let patients down. What shocked me was that wasn’t acknowledged by the government. Having said that, it was noticed by many politicians – and from that time the scrap the cap campaign was noticed. So is the message don’t be cynical – change is possible? You saw a shift? I saw a shift. It made a difference. Where are we on safe staffing – how do you plan to make progress? Wales has primary legislation [on staffing] and Scotland is well on the way, so give me one good reason why England and Northern Ireland aren’t? There is not necessarily a one-model-fits-all but there are ways of measuring it and making it accountable. I want to see primary legislation. I don’t want any politician to be unaware of that campaign. What needs to change to get staffing right? We have patients who are sicker and have complex needs. All the evidence is that you need to have the registered nurse there to have better outcomes. The biggest barrier to getting our workforce in place is the bursary being removed. If I had had to pay to become a nurse I would never have made it. I came from an extremely poor working-class family, we didn’t have any money. I didn’t own a book until I was 16. A pool of talent is being lost. I met with nursing students last week and their biggest issue is finance. Mr Hunt [health and social care secretary Jeremy Hunt] can talk about 10,000 nurse training places but how many come out the other end? There are huge attrition rates and a big part of that is money. People need a decent life. The bursary wasn’t perfect though, was it? It wasn’t perfect, but it was something. Our youth is being let down by the failure to deliver an effective workforce strategy. We have students working as HCAs because they need to finance their way through. We cannot continue like this. My personal view is that we need to reinstate the bursary now and work out what to replace it with. You don’t take something away without putting a safety net in place. How do you feel about the criticism of the pay offer? Was the best possible deal achieved? It is a complex deal but I would ask members to engage, ask questions and really understand the deal before they vote. I don’t think we would get anything better with a government that has an austerity platform in place, that's quite clear to me. Many nurses are concerned about the lack of funding for continuing professional development. CPD in a fast-changing environment is essential – it should be fully funded. Staff fund it themselves because they don’t want to fail. But having to make that sacrifice won’t make you feel valued. It is self-defeating in the end, isn’t it? It is. When staff have access to CPD they stay – and if they don’t stay, they progress to another employer. Employers shouldn’t be frightened of that. What else would keep people in the workforce? The biggest issue is a healthy workforce. Staff are expected to work longer, and the wear and tear is significant. That’s where flexibility is important, so people can work in different roles. If someone is unable to work clinically they may be able to do another role and continue to develop. And then you keep their experience. There is quite a debate about changing the routes into nursing. Some people believe the graduate nurse is under threat and needs to be defended. The graduate nurse is important and I won’t see it devalued. And yes, the nursing associate role was a political decision in many ways but it’s about enabling lots of different routes into nursing – try before you buy – and opening doors to people who may not initially meet the academic requirements. I don’t have a first degree, I went straight into doing a master’s when I was in my 50s. My family would never have allowed me to stay on at school. Sometimes your social circumstances don’t enable you to achieve [registered nurse status] but you are capable. There is a worry that the new roles will be used to get nursing teams on the cheap. Yes – and it’s not unique to the UK, it’s happening in Europe. I want to see an evaluation of some of these roles. I would hate to recreate the enrolled nurse position, it’s got to be different. The evidence is already there – registered nurses make a difference to outcomes, and it is outcomes that we should all be driven by. Belfast 2018 was, for her, a standout year. ‘It was a wonderful experience being in Northern Ireland – the warmth and kindness and general happiness. I normally do talk to a lot of people but I don’t think I’ve ever talked to so many people in my life. I couldn't walk five paces without being pounced on - it was great! The ‘richness’ of the debate on men in nursing will increase the RCN’s awareness about how it presents the image of nursing. ‘People in the debate talked about not stereotyping and making people aware this is not a female-only role.